In addition to improving the all-abilities trail, our Rock Creek Confluence Property was abuzz with activity this summer. For the third year, we hosted a University of Montana Bird Ecology Lab bird banding station. We welcomed 1st through 5th graders from the University of Montana Campus Recreation and the Montana Natural History Center’s summer camp programs. 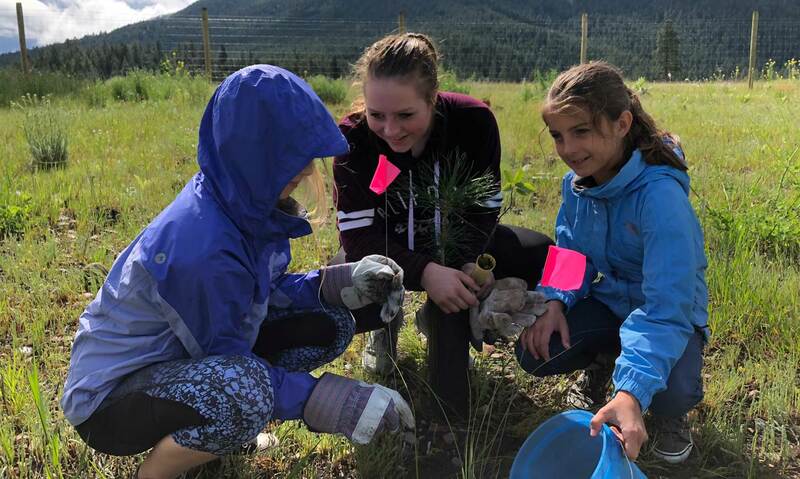 In partnership with the Clark Fork Coalition, Clinton School 7th graders used STEM skills to prescribe and administer land restoration through the Riparian Rx program (pictured above). 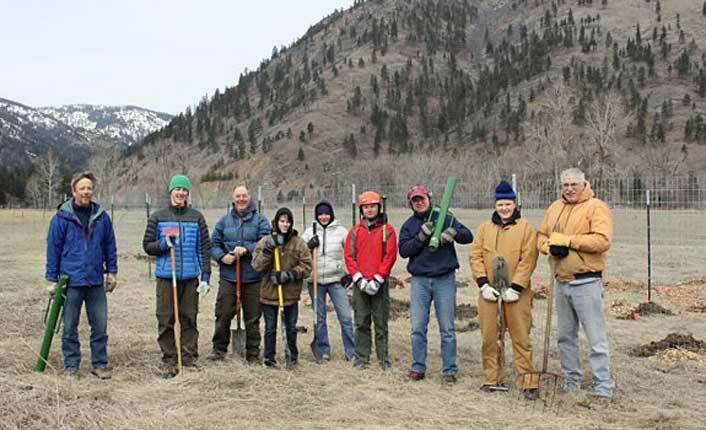 University of Montana Ecosystem Science and Restoration program students organized a volunteer day to plant 300 native shrubs on the recovering riparian area. Staff from Anderson ZurMuehlen & Co., kids from Youth Homes, Missoula County Weed District Youth in Restoration crew members, and Five Valleys’ Hands on the Land volunteers helped to water and mulch these new riparian shrubs over the summer. Planting shrubs at the restored riparian area. Photo by Olga Helmy. Braden Collard recruited fellow Boy Scouts to complete his bird habitat Eagle Scout project in the west side meadow. Veterans from Team Rubicon sharpened their first responder chainsaw techniques while assisting with timber thinning projects. We worked with the Confederated Salish and Kootenai Tribes’ Séliš-Ql̓ispé Culture Committee to design interpretive signs. Braden Collard and his crew building his bird habitat Eagle Scout project. Photo courtesy of Braden Collard. Across the 300-acre property, we continued our efforts to mitigate noxious weeds and seed more desirable species. All this amazing progress was made possible by support from the U.S. Forest Service and the National Fish and Wildlife Foundation, as well as funding from a Natural Resources Conservation Service Environmental Quality Incentives Program (EQIP) grant. Finally, the Confluence welcomed visitors from around the world who stayed at the Confluence Cabin, which is available to rent year-round on Airbnb.